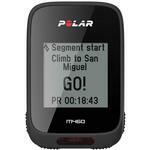 Track and share your cycling performance with this Polar GPS bike computer. It provides accurate distance, speed and altitude monitoring via its built-in GPS and barometer, and it comes with a 60-day Strava premium subscription to let you participate in Strava Live Segments. Receive smartphone notifications conveniently through this Bluetooth-enabled Polar GPS bike computer.